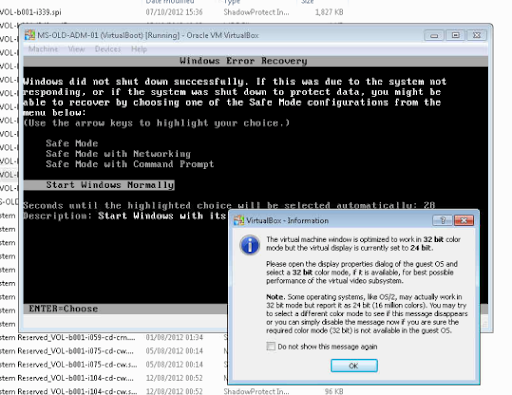 How to recover a Shadow Protect Backup to a Virtual Machine. The first step is to use a computer that has Shadow Protect installed, this means you have plug in to boot from an SPI file. 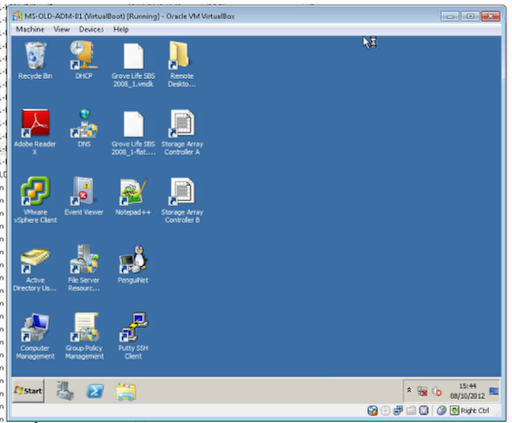 Locate the SPI file you want to recover from, in this example I have chose a backup file from 8th October at 15:36. 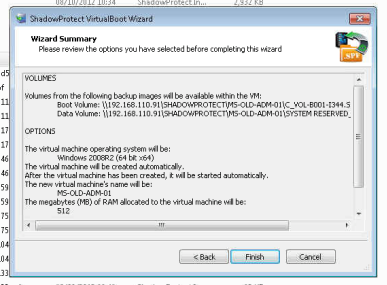 The VirtualBoot wizard will now start. 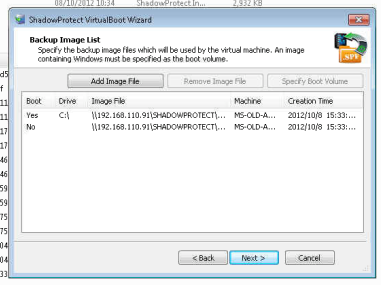 Shadow Protect will not verify the images files that are in this backup chain. In this instance I can see the two disks I expect in this server. The wizard will now ask what the operating system is of the computer to be restored, select the Operating System version. Note the Network Adapter high lighted with the arrow, this will configure the Virtual Machine in a Bridged Configuration so it will find an IP address from DHCP in the subnet of the host machine we are restoring from. 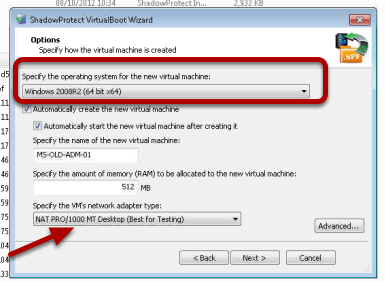 NB always use the Isolated Network Adapter if you are performing a test recovery so you do not connect a test machine to a production environment. Confirm your settings and begin the restore. 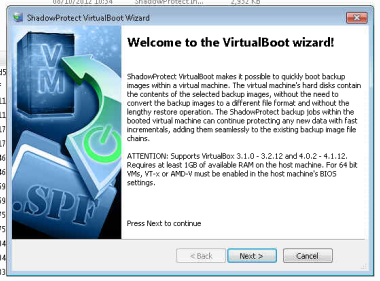 Shadow Protect will now perform a Hardware Independent Restore of the server, this will automatically configure the drivers for the hard disk and other storage drivers so that the computer boots within a Virtual Environment. 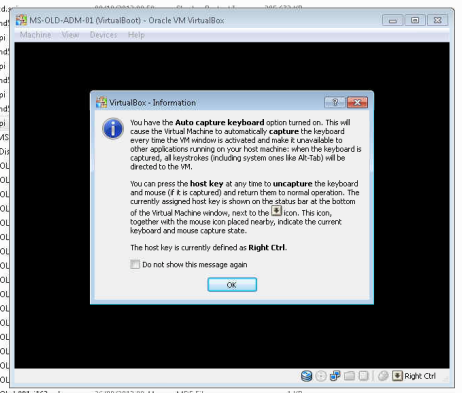 The server will now boot for the first time and you will be warned about capturing the mouse and keyboard in the VirtualBoot environment. Because the Server was backed up while it was running Windows recognises that it has started from a restore and displays the Windows did not shut down successfully message. This is normal behaviour. The Server continues to boot. 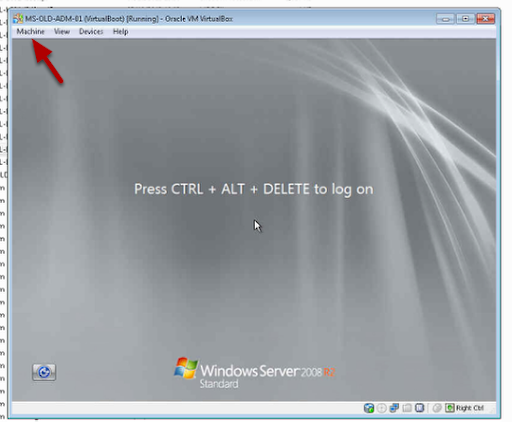 The server is recovered and you can login by choosing Machine, then Press Ctrl Alt Del. The server is now back onine as a Virtual Machine, this server can now be tested that all applications are running and any changes to IP address made if the server had a static IP address previously. 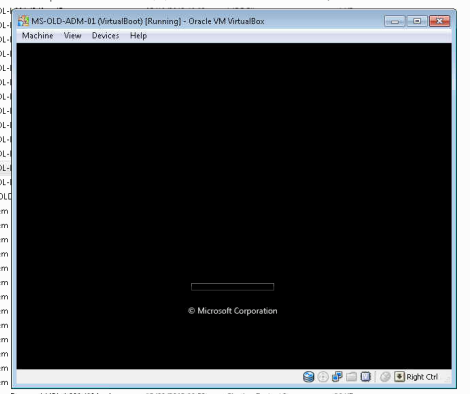 This Virtual Machine will continue to backup to the Managed Online NAS and can be used as a live producton server until the original server is repaired. Thanks for the feedback Charles! In it together. Or are we? Why should we share with our peers?